Aromatherapy: I'm not sure when the word was coined, but it came into vogue in the last decade. From Harris Teeter to the Body Shop, groceries and specialty shops do a brisk trade in scented candles, lotions, and bath gels. At the end of a day spent squinting at your computer, you can rest your tired eyes under a clove-scented eye mask. I confess to spritzing a little lavender sheet spray on my pillow before turning off my lamp at night. These scented goods promise not only olfactory pleasure but spiritual and personal transformation. "2 New Aromatherapy Blends" from Bath and Body Works will "Give your mood a makeover." "Because scent is at the center of a calm mind" you should purchase Lavish Aromas Aromatherapy Pillows. According to aromatherapy expert Francoise Rapp, the combination of rose, patchouli and orange can "Awaken … Your Sense of Self." Comfycountrycreations.com hawks scented neck pillows, which will not only "give relief to sore, aching muscles" but also "soothe … the soul." It's not just New Agers who are interested in scent. Bob and Karen Tosterud have created a line of Christian candles called His Essence. The Resurrection candle is based on Nicodemus' myrrh and aloe (see John 19:39-40); the servanthood candle was inspired by the nard Mary poured on Jesus' feet in John 12:3. These candles are billed as "creations to comfort the soul," and the Tosteruds hope the candles will help those who light them "Sense Him in a new way." The spirituality of smell may be trendy, but it is not new. 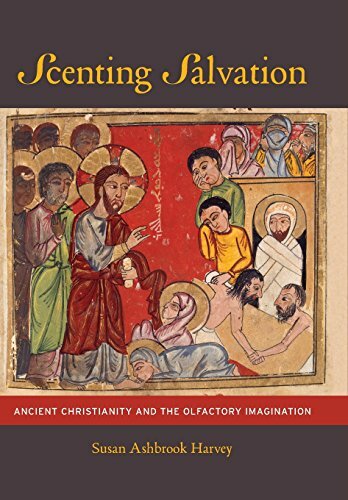 Scenting Salvation, Susan Harvey's fascinating and engrossing study of the place of smell in the early church, makes clear that scent and smelling have long been understood as crucial pieces of the Christian spiritual life.